It’s 1:30 a.m., a time when most people are asleep. Your neighborhood is in darkness, except for a few street lamps. Someone—he doesn’t identify himself and the voice isn’t familiar—is pounding on your front door, demanding that you open up. Your heart begins racing. Your stomach is tied in knots. The adrenaline is pumping through you. You fear that it’s an intruder or worse. You not only fear for your life, but the lives of your loved ones. The aggressive pounding continues, becoming more jarring with every passing second. Desperate to protect yourself and your loved ones from whatever threat awaits on the other side of that door, you scramble to lay hold of something—anything—that you might use in self-defense. It might be a flashlight, a baseball bat, or that licensed and registered gun you thought you’d never need. You brace for the confrontation, a shaky grip on your weapon, and approach the door cautiously. The pounding continues. 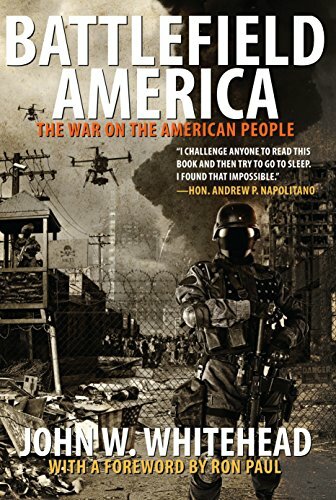 Battlefield America: T... John W. Whitehead Best Price: $12.44 Buy New $19.55 (as of 06:50 EDT - Details) You open the door to find a shadowy figure aiming a gun in your direction. Immediately, you back up and retreat further into your apartment. At the same time, the intruder opens fire, sending a hail of bullets in your direction. Three of the bullets make contact. You die without ever raising your weapon or firing your gun in self-defense. In your final moments, you get a good look at your assailant: it’s the police. This is what passes for “knock-and-talk” policing in the American police state. “Knock-and-shoot” policing might be more accurate, however. Whatever you call it, this aggressive, excessive police tactic has become a thinly veiled, warrantless exercise by which citizens are coerced and intimidated into “talking” with heavily armed police who “knock” on their doors in the middle of the night. Poor Andrew Scott didn’t even get a chance to say no to such a heavy-handed request before he was gunned down by police. It was late on a Saturday night—so late that it was technically Sunday morning—and 26-year-old Scott was at home with his girlfriend playing video games when police, in pursuit of a speeding motorcyclist, arrived at Scott’s apartment complex, because a motorcycle had been spotted at the complex and police believed it might belong to their suspect. At 1:30 a.m., four sheriff’s deputies began knocking on doors close to where a motorcycle was parked. The deputies started their knock-and-talk with Apartment 114 because there was a light on inside. The occupants of the apartment were Andrew Scott and Amy Young, who were playing video games. First, the police assumed tactical positions surrounding the door to Apartment 114, guns drawn and ready to shoot. Then, without announcing that he was a police officer, deputy Richard Sylvester banged loudly and repeatedly on the door of Apartment 114. The racket caused a neighbor to open his door. When questioned by a deputy, the neighbor explained that the motorcycle’s owner did not live in Apartment 114. This information was not relayed to the police officer stationed at the door. Understandably alarmed by the aggressive pounding on his door at such a late hour, Andrew Scott retrieved his handgun before opening the door. Upon opening the door, Scott saw a shadowy figure holding a gun outside his door. Still police failed to identify themselves. Unnerved by the sight of the gunman, Scott retreated into his apartment only to have Sylvester immediately open fire. Sylvester fired six shots, three of which hit and killed Scott, who had no connection to the motorcycle or any illegal activity. Was it Andrew Scott, who was prepared to defend himself and his girlfriend against a possible late-night intruder? Was it the police officers who banged on the wrong door in the middle of the night, failed to identify themselves, and then—without asking any questions or attempting to de-escalate the situation—shot and killed an innocent man? Was it the courts, which not only ruled that the police had qualified immunity against being sued for Scott’s murder but also concluded that Andrew Scott provoked the confrontation by retrieving a lawfully-owned handgun before opening the door? Or was it the whole crooked system that’s to blame? I’m referring to the courts that continue to march in lockstep with the police state, the police unions that continue to strong-arm politicians into letting the police agencies literally get away with murder, the legislators who care more about getting re-elected than about protecting the rights of the citizenry, the police who are being trained to view their fellow citizens as enemy combatants on a battlefield, and the citizenry who fail to be alarmed and outraged every time the police state shoots another hole in the Constitution. What happened to Andrew Scott was not an isolated incident. In fact, the Michigan Supreme Court is currently reviewing a case in which seven armed police officers, dressed in tactical gear and with their police lights on, carried out a knock-and-talk search on four of their former colleagues’ homes early in the morning, while their families (including children) were asleep. The police insist that there’s nothing coercive about such a scenario. Whether police are knocking on your door at 2 am or 2:30 pm, as long as you’re being “asked” to talk to a police officer who is armed to the teeth and inclined to kill at the least provocation, you don’t really have much room to resist, not if you value your life. Mind you, these knock-and-talk searches are little more than police fishing expeditions carried out without a warrant. The goal is intimidation and coercion. Unfortunately, with police departments increasingly shifting towards pre-crime policing and relying on dubious threat assessments, behavioral sensing warnings, flagged “words,” and “suspicious” activity reports aimed at snaring potential enemies of the state, we’re going to see more of these warrantless knock-and-talk police tactics by which police attempt to circumvent the Fourth Amendment’s warrant requirement and prohibition on unreasonable searches and seizures. 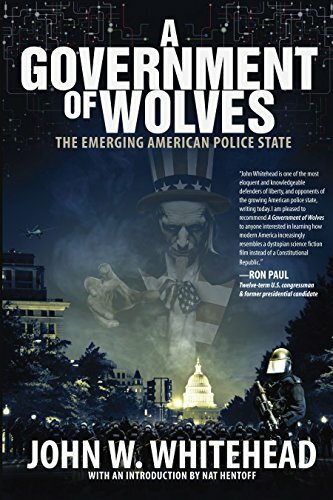 We’ve already seen a dramatic rise in the number of home invasions by battle-ready SWAT teams and police who have been transformed into extensions of the military. Indeed, with every passing week, we hear more and more horror stories in which homeowners are injured or killed simply because they mistook a SWAT team raid by police for a home invasion by criminals. Never mind that the unsuspecting homeowner, woken from sleep by the sounds of a violent entry, has no way of distinguishing between a home invasion by a criminal as opposed to a government agent. Too often, the destruction of life and property wrought by the police is no less horrifying than that carried out by criminal invaders. These incidents underscore a dangerous mindset in which civilians (often unarmed and defenseless) not only have less rights than militarized police, but also one in which the safety of civilians is treated as a lower priority than the safety of their police counterparts (who are armed to the hilt with an array of lethal and nonlethal weapons). In fact, the privacy of civilians is negligible in the face of the government’s various missions, and the homes of civilians are no longer the refuge from government intrusion that they once were. It wasn’t always this way, however. There was a time in America when a person’s home was a sanctuary where he and his family could be safe and secure from the threat of invasion by government agents, who were held at bay by the dictates of the Fourth Amendment, which protects American citizens from unreasonable searches and seizures. The Fourth Amendment, in turn, was added to the U.S. Constitution by colonists still smarting from the abuses they had been forced to endure while under British rule, among these home invasions by the military under the guise of writs of assistance. These writs were nothing less than open-ended royal documents which British soldiers used as a justification for barging into the homes of colonists and rifling through their belongings. To our detriment, we have now come full circle, returning to a time before the American Revolution when government agents—with the blessing of the courts—could force their way into a citizen’s home, with seemingly little concern for lives lost and property damaged in the process. Actually, as I make clear in my book Battlefield America: The War on the American People, we may be worse off today than our colonial ancestors when one considers the extent to which courts have sanctioned the use of no-knock raids by police SWAT teams (occurring at a rate of 70,000 to 80,000 a year and growing); the arsenal of lethal weapons available to local police agencies; the ease with which courts now dispense search warrants based often on little more than a suspicion of wrongdoing; and the inability of police to distinguish between reasonable suspicion and the higher standard of probable cause, the latter of which is required by the Constitution before any government official can search an individual or his property. Clearly, we don’t live in a democracy. No, in the American police state, when you find yourself woken in the early hours by someone pounding on your door, smashing through your door, terrorizing your family, killing your pets, and shooting you if you dare to resist in any way, you don’t need to worry that it might be burglars out to rob and kill you: it’s just the police.